The Alumni Association offers dozens of ways to get involved with the Johns Hopkins community. No matter your interest, background, hometown, or availability, we’ve created a vast array of opportunities for you to become active in the life of the university. GoHopOnline.com is the Johns Hopkins community's web-based networking platform dedicated to helping Johns Hopkins alumni connect online with former classmates and like-minded graduates; mentor and coach current students and recent graduates; and expand career connections through insider contacts in top companies. New to New York? Lost in London? Chances are there are other Johns Hopkins graduates in your city who are eager to welcome you to your new surroundings. There are almost 100 alumni chapters, clubs, and affinity communities worldwide, all of which are dedicated to planning fun events that promote alumni interaction. Learn more about your chapter or club and get involved. Got interests? Of course you do. The Alumni Association is always seeking alumni leaders to help guide our communities. With your help, we can strengthen the Johns Hopkins alumni community together. Stay connected. Share. Win rewards. 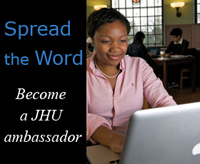 Become a social media ambassador - a Hopkins Promoter - and help spread the word about the latest news and events going on at Hopkins to your friends, followers, and colleagues on Facebook, Twitter, and LinkedIn. Each time you share content, you’ll earn points for more chances to win prizes. Learn more and sign up at alumnijhu.socialtoaster.com. If you would like to help plan reunion events for your class, you can join your class committee. Call the Homewood Reunion and Homecoming team at the Central Office of Alumni Relations at 410-516-5185, or email us at reunion@jhu.edu. The Career Center partners with alumni to help current students explore different career options, locate internship and job opportunities, and prepare for upcoming interviews. If your organization is currently hiring either for internship or full time opportunities, visit the Career Center website. The Alumni Council is a 63-member governing body of the alumni association. It meets once a year to establish policy, reacquaint members with the university and its programs, and advise the university on alumni affairs. Members, who must be nominated, serve three-year terms, renewable once. They must annually support the development efforts of the university. For more information, contact the Office of Alumni Relations at 800-JHU-JHU1 (800-548-5481) or 410-516-0363 (in Baltimore and outside the U.S.), or email alumni@jhu.edu.